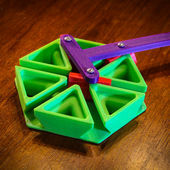 This mechanism consists of a base with three slots intersecting at angles. Three sliders are confined within the slots and are attached to a handle by pivots (screws) at fixed positions along the handle. It is often sold in novelty shops with interesting names like Bullsht Grinder, Bullsht Masher or Do-Nothing Machine. Interestingly, most of the names are preceded with state names such as Arkansas, Kentucky, etc. I guess that’s how locals make fun of their neighbors. Print in PLA or ABS. You will need 4 screws for the sliders and knob.